How Can I Discharge Student Loan Debt in Chapter 7 Bankruptcy? Student loan debt is notoriously difficult to discharge in Chapter 7 bankruptcy. Unlike other kinds of unsecured loans, federal law grants special protections for most student loans. This means that even if you successfully complete the Chapter 7 process and receive a discharge from the bankruptcy court, your student loan obligations remain. Can a Bankruptcy Court Punish You For Completing Multiple Degrees? But it is possible to discharge a student loan in bankruptcy if the debtor can prove it “would impose an undue hardship” on them and their dependents. This is not easy. If you seek an undue hardship discharge, you are likely facing a trial and multiple rounds of appeals to defend your impoverished status. Lenders know the law gives them an advantage and they will not hesitate to use it. Consider a recent decision by the U.S. 11th Circuit Court of Appeals, which has jurisdiction over bankruptcy appeals from Florida. This case actually originated in Alabama. The debtor in this case is a woman who filed for Chapter 7 bankruptcy protection and received a discharge. Not included in the discharge was $112,000 in outstanding student loans. The debtor applied for a hardship exemption, which the bankruptcy judge granted. The lender then appealed that decision to the district court, which has supervisory jurisdiction over the bankruptcy judge. The district court, disagreeing with the bankruptcy judge, said the debtor had not proven she would suffer an “undue hardship” and refused to discharge the loan. 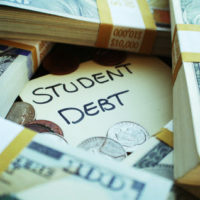 Among other reasons, the district court said the debtor only had herself to blame for taking out loans “to pursue her multiple educational goals.” The debtor appealed this ruling to the 11th Circuit. In this case, the 11th Circuit said the district court may not have applied the correct standard, therefore it was necessary to remand (return) the case to the lower court for further proceedings. The 11th Circuit did note, however, that it is inappropriate to punish a debtor for her prior financial decisions. In other words, even if the debtor “has acted foolishly or recklessly” by taking out loans to obtaining multiple degrees, that should not factor into a decision regarding her current “undue hardship” status. Do You Need Help Dealing With Your Student Loan Debt? On the one hand, the government encourages people to attend college and improve themselves by subsidizing student loans. On the other hand, the government makes it extraordinarily difficult for people unable to find work after college get out of their crippling loan debt. This is why it is important to speak with a Miami bankruptcy attorney if you are having difficulty paying back your student loans. At the Law Office of Julia Kefalinos, we can help explain your options and help you get back on your feet.